The Kitlanya East Project (KIT-E) consists of licenses 070/2017, 071/2017 and 072/2017 located on the southern margin of the Kalahari Copper Belt in proximity to both the T3 and Banana Zone deposits. 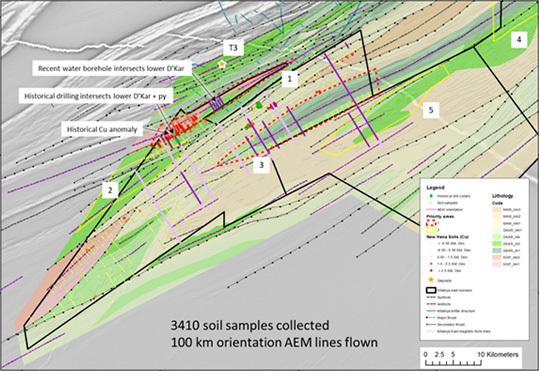 Re-interpretation of magnetic data has identified a number of anticlinal structures where potential Cu-Ag mineralisation may be upgraded. This interpretation is supported by historical and recent sampling as well as water borehole data. Recent soil sampling identified a Zn anomaly associated with the northern anticline target. The anomaly is comparable to results over T3, situated only 4km to the north.